I've been wearing wash-n-go's consistently lately. Basically alternating between that and buns. Oh, have I mentioned that I've decided to grow my hair back out? Indeed, I am. I'm missing those inches I chopped off and have decided to grow it back out to mid-back-length or maybe even waist-length. I'm really missing the inches because of my new found love of the wash-n-go, and I wouldn't mind it hanging a bit longer. Shrinkage is real, ya'll! So I've decided that I would start bunning my hair again consistently and just give it a rest for stretches at a time. My plan is to bun during the week, and then wash-n-go on the weekends. Of course, if something comes up and I need to "get cute" during the week, I will bust out the wash-n-go then as well. I've been able to get 3 days out of one wash-n-go by preserving it the same way I preserve my braidouts/twistouts---putting in about 5-6 large twists at night. This also stretches it, which makes 2nd day hair my FAVORITE. I could probably get even more days out of a wash-n-go, but I think 3 days is more than enough. 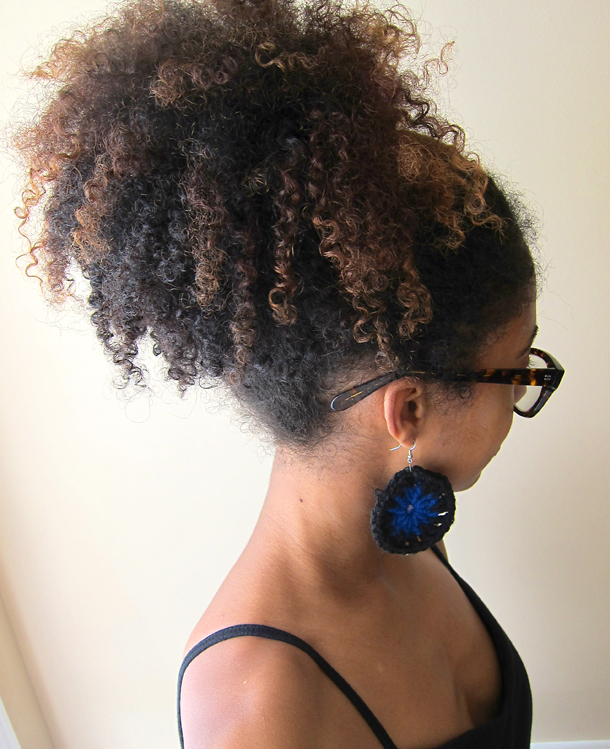 I've also been pulling my hair into an old, tried-and-true puff. I haven't really worn puffs in YEARS. It's kind of nice to take it all back to things I did when I first started out in my hair journey. Hopefully, I can stick to this new and simple regimen. Wish me luck! yes yes yessss to this pony! your highlights are perfection. I still haven't worn a wash and go. Hopefully soon. I use to NEVER wear them. Decided to give it a go one more time, and now I'm in love. Definitely try out styles that at one time you may have hated. Things change!